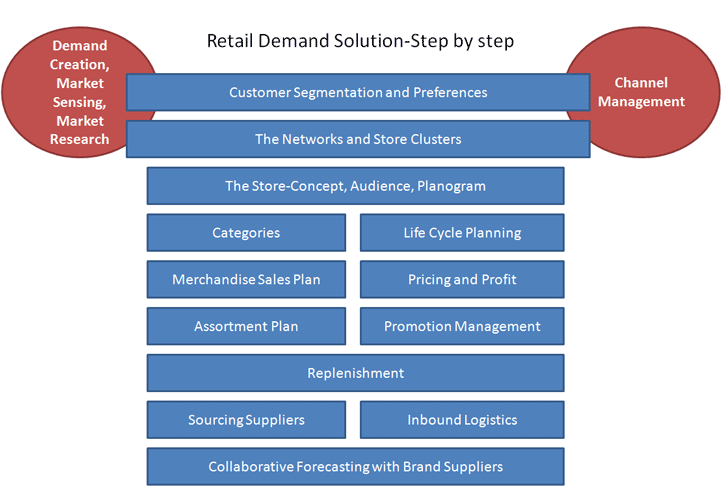 Revised CPG Retail Footprint - from Merchandising to Supply Chain - Part 1 of 3. Last week we did a webinar on the 7 Myths of Merchandising with our great friend Inez Blackburn of Market Techniques and Innovation and some great questions surfaced on the adoption of solution platforms. You’ll have to hear the webinar to get the myths, and get the book, Pride Passion Profit, but we can discuss the answers to the questions here. The key areas we see this year, where solutions are being successfully adopted and rolled out, still is in the planning and analytics arena.1 Across the consumer ecosystems, purchases range from ERP to update ecommerce; to marketing analytics to capture customer preferences; to Merchandising and assortment planning, Trade Promotion Management, and Demand Forecasting. There are great cases emerging showing how these are being successfully used and improved upon (if the enterprise had bought, but only modestly used up until now). In many instances, a basic foundation was put in place, and users got the benefits, and never went back to improve upon what they had. In the current climate, this is an attractive option, and we see more organizations getting data-centric, learning to access data and use it effectively. Demand management provides a fundamental core (see Demand Management in the Second Decade). It is critical to get this foundation in order, with solutions, data, process management and selecting the right ‘math,’ discipline in meetings such as S&OP (see how to manage this process better in From Complexity to Clarity). S&OP is a topic of current interest. It’s like a Frank Sinatra re-incarnated into a Michael Buble (i.e. a concept that has been around a long time and rediscovered by a new generation). Although there are some unique aspects to S&OP, the real success is in demand and production planning data systems that fundamentally operate in real-time, that can simulate and capture changes, and assure that these changes are propagated into the plan. Users don’t want to look at a bunch of reports and spreadsheets—Frankie—but simulate and see the effects in real-time—the jazzier Michael. In the next few articles, we will share several views of the technology footprint that makes a great multi-channel retail ecosystem, covering topics such as customer experience, supply chain, and operational systems (POS, ecommerce, payment, warehouse, etc.). 1 We expect the major vendors to turn in some decent sales numbers this year in these categories.